Today, I’m interviewing a friend and critique partner. I’m so excited for her new book which hit online retailers yesterday. I would probably hang out with Dakota Bryant, the heroine in What if We Break. We’ve all experienced loss, and like so many people it seems, I fight with depression and anxiety, which plays a part in Dakota’s character. We would probably go for coffee, or maybe grab a drink, somewhere chill. A place where you could just hang out, maybe grab a bite, and just talk. This particular book is kind of an introduction of sorts to the fictional small town of Serendipity, Texas. 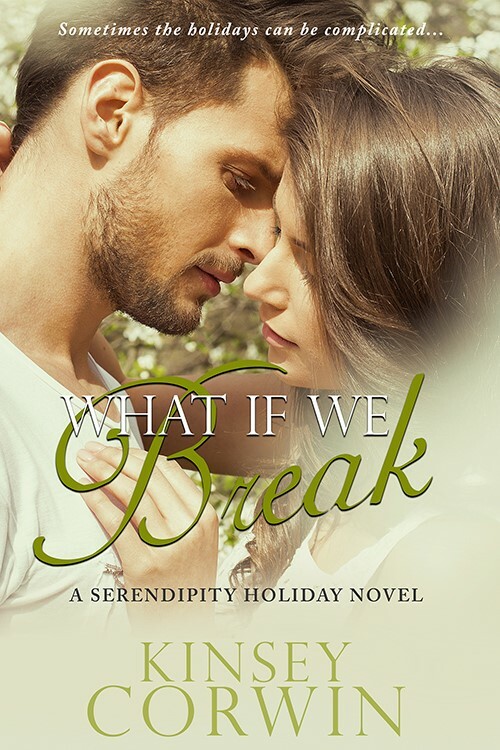 In What if We Break, the readers get to meet Dakota and Kreed Bryant, a married couple who at the start of the book are separated. They’ve faced a lot of trials in their marriage and struggle to come back on common ground. There will be more books in this small town, but this really gave me a chance to explore the town and some of the handful of characters that have been occupying my mind lately. Ooh…my favorite part, without giving too much away, is what the hero, Kreed Bryant, does to try and set things right with his wife. Do you have a day job in addition to being a writer? I do have another job! I work as a barista in a family owned coffee shop in my small town of Cedar City, Utah. It is such a blast…and in some ways (as my niece has informed me) is very 90s cliché for an author. Dakota Bryant has had more than her share of heartache, especially around the holidays. With her best friend’s wedding quickly approaching and her estranged husband in the wedding party, she’s not likely to catch a break. Hopefully, she can survive the Christmas week with her heart and sanity still intact. Author. Hopeless romantic. Overall mess. That sums Kinsey Corwin up in a nutshell. But, if you would like a little bit more info on her, she was born in San Antonio, lived in the Southwest most of her life with a brief stint in Panama and California during her childhood. The majority of that time has been among the glitz and glam of Neon Lights known as Las Vegas, until recently when she relocated to a small college town in Southern Utah. She loves baseball, has an obsession with the Boston Red Sox although she’s never been to the East Coast, and she had a real ugly cry going when Big Papi retired. She’s a Contemporary Romance author who loves the idea of small town romances, friends to lovers, and rekindled or second chance loves. Her heroes can range from cowboys to musicians, soldiers to sheriffs, wannabe chefs or mechanics. The stories are usually fueled by her love of the water, country music, childhood memories as a military brat, and her own deep love of creative pursuits which include cooking, writing, and drawing. You will often find these elements present in the tales she weaves in one form or another. Thank you so much for having me on your blog today, Lori! I really enjoyed the interview. Thanks Beth! I’m excited too! I’m busy working away on it. Kinsey Corwin | We Have Cover Art! I don’t know that it is Hallmark ready…but thanks for the amazing compliment, Sara! It was a great interview, so thank you! The book sounds fantastic and I love the story world that I’ve had glimpses of. So glad to be a part of sharing it.